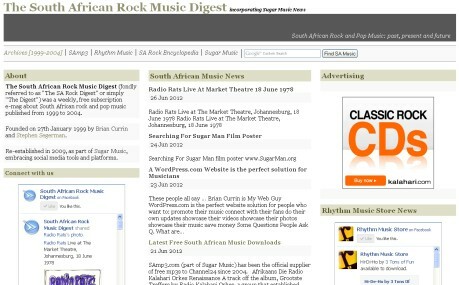 The SA Rock Digest was a weekly, free subscription e-mag about South African rock and pop music from 1999-2004. Founded on 27th January 1999 by Brian Currin and Stephen "Sugar" Segerman. Re-established in 2009, as part of Sugar Music, embracing social media tools and platforms. 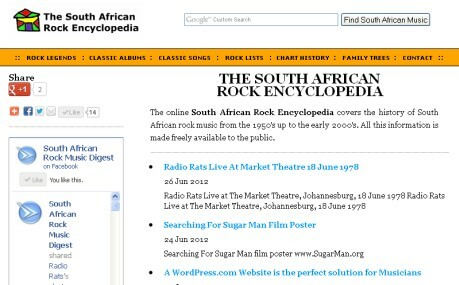 The online South African Rock Encyclopedia covers the history of South African pop and rock music from the 1950's up to the early 2000's. All this information is made freely available to the public. SAmp3.com can help South African musicians and music labels promote your music through channel24 and other online platforms. And the best part is, there is no cost to you! The SA Rock Digest, a weekly, free subscription e-mag, was founded on 27th January 1999 and last published on 12th April 2004. Re-established in 2009, embracing social media tools and platforms. 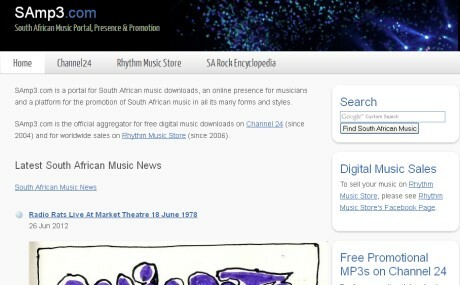 SAmp3.com helps South African musicians and music labels promote their music through channel24 and other online platforms. The online South African Rock Encyclopedia covers the history of South African rock and pop music from the 1950's up to the early 2000's. All this information is made freely available to the public.